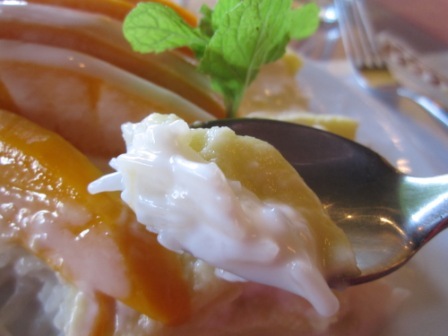 Last weekend presented some good eating opportunities in the desserts category. And I ended up getting 3. 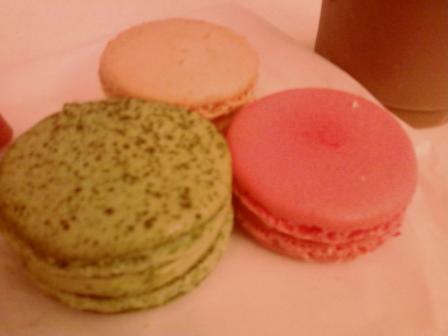 The macaroons were cheerfully hued, light, creamy centered, sugary delights. The banana had good banana cream filling but not so much caramel flavor. 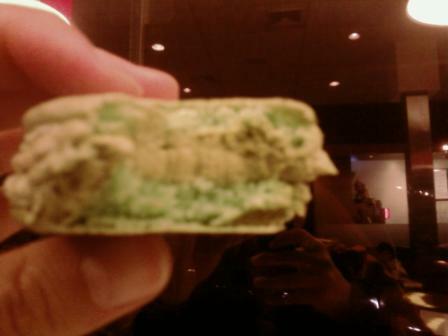 Matcha had a nice green tea pop and I love how the inside is so bright green! Strawberry with a black currant surprise in the middle for a little more chewy texture. 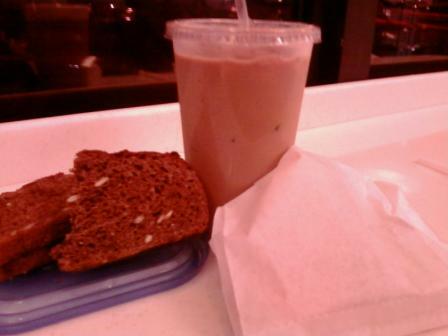 I had packed a pbj on La Tour squaw bread from the farmer’s market for a snack and also bought a vietnamese ice coffee so it was a meal! The only real downside was the price. 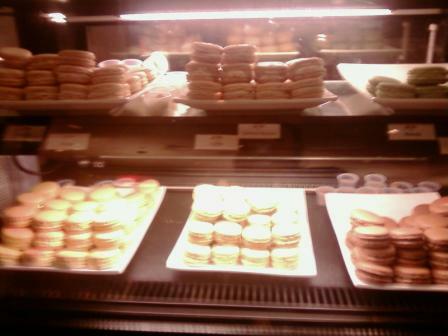 They were $1.75 x 3 = $5.25 for 3 macaroons… a little on the pricey side for a few cookies but hey, just more economic portion control. 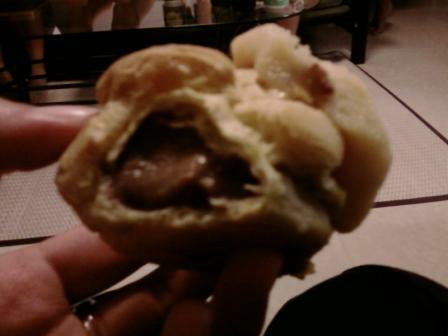 I also went to a friend’s house for dinner last weekend and someone brought Liliha Bakery Coco Puffs. 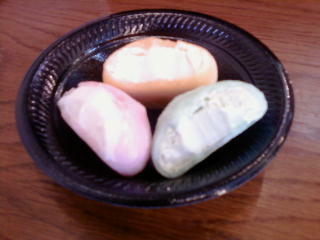 These are apparently Liliha Bakery’s specialty. 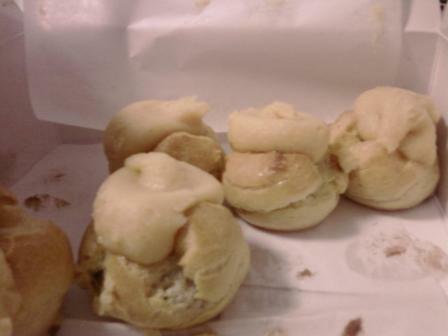 They are chocolate filled cream puffs with a signature Liliha topping that you see in the picture. 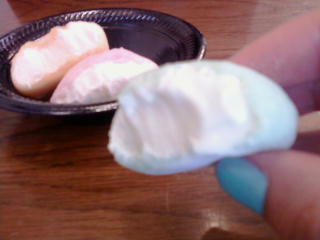 I don’t think I’ve ever had anything quite like this topping, not quite a frosting but very think, sweet, and buttery. The girl who brought them said there was a woman getting a cake frosted in the stuff when she picked them up at the bakery! I also made a haupia pie to take to my friend’s dinner. 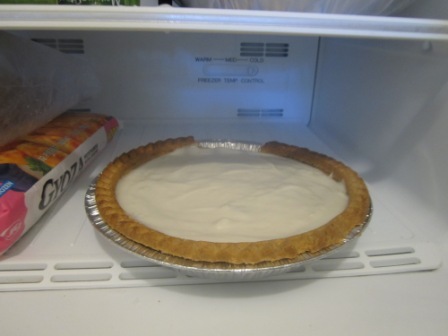 If you don’t know what that is see my pi day post! I only had a few hours hence the speed cooling in the freezer. Wow, so I’ve fallen behind in updating… Studying took over a little bit I guess. Nonetheless I have still been eating! Last Sunday I was peregrinating around UH campus area on Dole St. looking for some dinnahs. I was looking for maybe a ramen shop or Chinese or something and there were a few no-goes. I walked a little further down and there was a restaurant called “Spices” spelled with chili peppers calling itself a southeast asian restaurant. I love Thai food and despite only having been open for a little while there were already 2 people eating inside. It looked pretty nice and I was getting hungrier so I walked in. 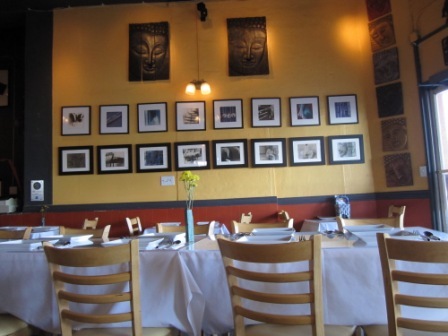 It was a nice little restaurant with light streaming in on the yellow-gold paint with framed pictures and buddhas around. 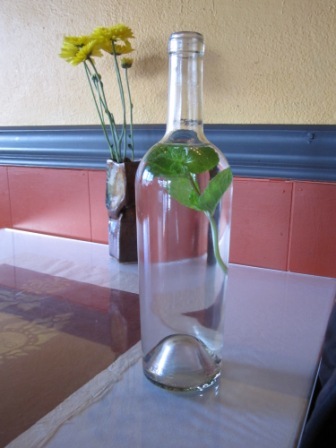 They put mint in the water bottles which looked pretty classy. The water didn’t taste like mint or anything but it looked cool. 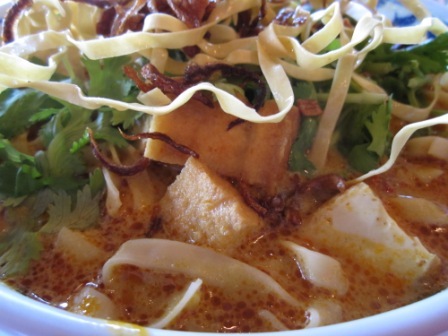 I ordered the Burmese Ono Khao Soi. 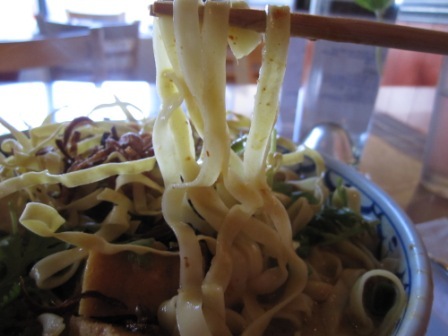 Noodles in curry with tofu and cilantro topped with crispy fried noodles on top. Delish. 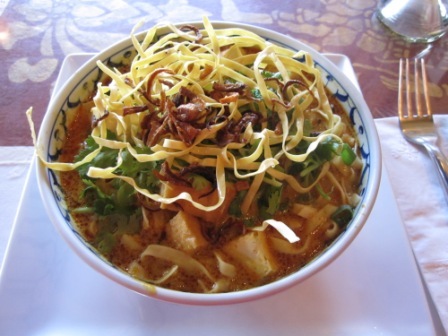 I’ve never had noodles in curry but it was really good. I love curry because even the tiniest leftovers makes another meal if you just mix it with rice. A little leftover curry goes a long way! Of course I had to have dessert. 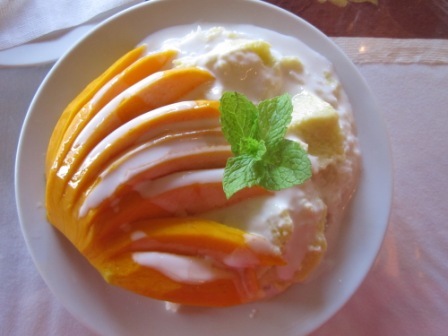 Khao Niew Kha Thi is the Burmese mango sticky rice with a coconut custard. I had to pay extra for the mango but mangoes are worth it. 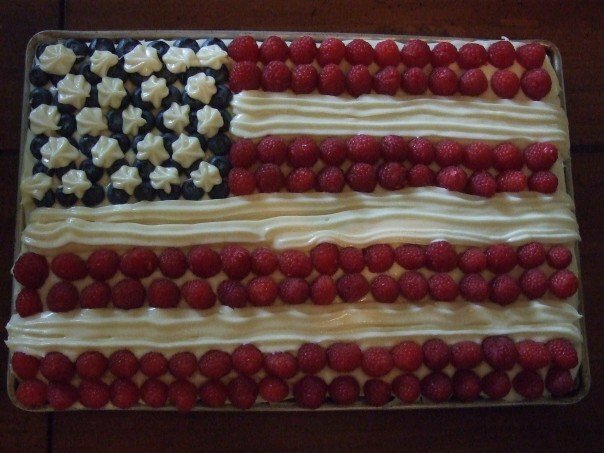 It was garnished with mint and I totally ate it too. At last after a few weeks on island I have finally made it to Bubbie’s Ice Cream!! For weeks I had been unknowingly passing it pergrinating to grocery stores and bus stops in the area but I finally snooped around for it after my sailing class last week. I went to the one off University Ave near UH Manoa and it’s kinda in the back corner away from the intersection. 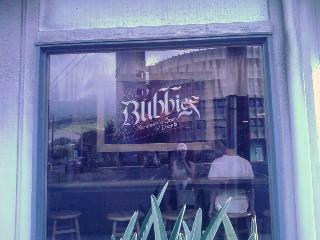 It doesn’t really matter though because it seems everyone knows where it is because it’s Bubbie’s! People were coming in and out the entire time I was there for a constant line. It was a cute space with a colorful chalkboard menu detailing sundaes and little wooden tables and chairs with framed articles detailing the glory of the ice cream mochi decorating the walls. There was an ice cream counter and display case of some yummy looking peanut butter pies and such but seriously my query was ICM. I digress. So let’s get down to business to defeat … the Huns I mean about the ICE CREAM MOCHI!! It is truly a beautiful sight to behold. 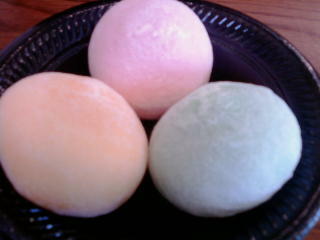 They’re like perfect, pastel, jewels of ice cream enveloped in a precise layer of chewy mochi. They were pretty frozen and I was initially a little hesitant to bite into them for fear of cold tooth syndrome, but of course I did. 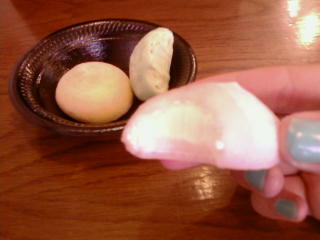 I actually found the mochi acts as a protective layer for cold sensitive front teeth. I told you this was good stuff. There was a small board listing the mochi flavors of the day and there were a little more than 10. There were your standards like vanilla and chocolate, the tropicals like lilikoi (Hawaiian for passion fruit) and guava, and the Japanese influenced like the sakura and green tea from what I can remember. I believe the more specialized flavors rotate daily. 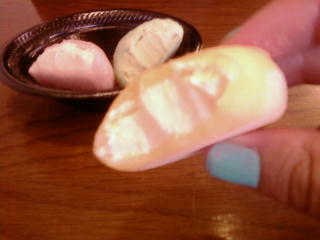 The lilikoi ICM was bright and sunny with lilikoi ice cream wrapped in lilikoi mochi. The sakura was a cute pink with vanilla interior and I think sakura is the cherry blossom festival in Japan? 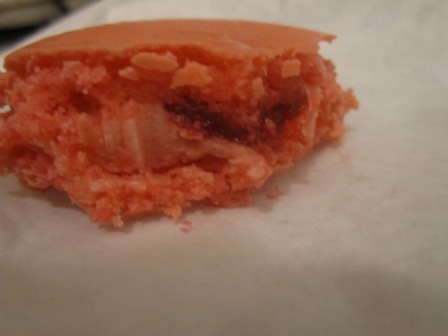 I didn’t really taste cherry in the mochi or maybe it’s called sakura just based on the cherry-blossom-pink color? It was good nonetheless. 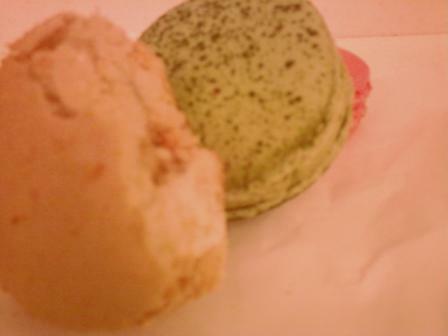 Finally, the green tea ice cream lined with green tea mochi. Delish. I’m pretty sure I’ve had green tea ice cream mochi from Trader Joe’s before… The taste was pretty comparable. I’ll have to scout those out when I get home. Ice cream is all about the texture: the smooth, creamy, coldness melting in your mouth and paired with delicate, chewy mochi it is a perfect compliment. A match made in heaven. And to bring you back down to Earth, they go for $1 a pop and I read on one of the articles posted on the wall that they are 1/4 oz ice cream balls. So I guess $1 for a quarter of an ounce of ice cream is pretty pricey? but I’ll think of it more as economic portion control. If you buy more it does get slightly cheaper, 3 for $2.95 (5 cents, whoopie) up to 12 for $11. There were people buying two dozen of these babies to go and $3 for a nice ice cream repast isn’t bad. That doesn’t mean I’m not coming back! I only wish they had a bathroom. I really wanted to wash my hands after my sailing class. And of course there’s that styrofoam bowl. 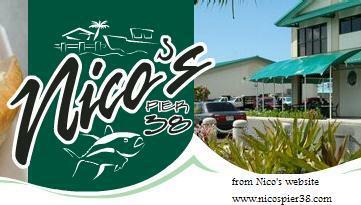 Last post was about the Honolulu Fish Auction and right around the corner was Nico’s where we had breakfast. Nico’s is right on the same pier as the auction warehouse so the fish here probably travels 100ft on land before it’s cooked. It was a causal place ordering at a counter with outdoor seating under a canopy. I got the catch of the day omelette which was swordfish. 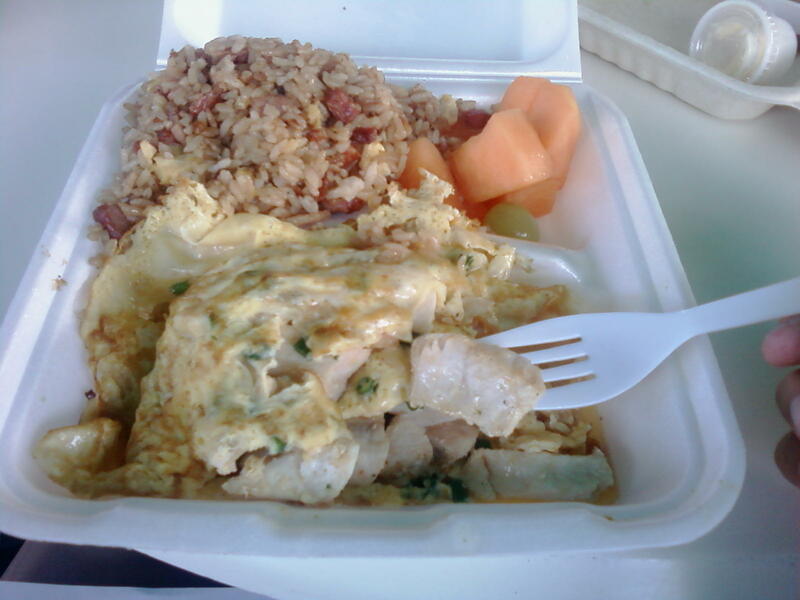 The fish was wrapped in a green onion omelette with a side of fried rice and fruit. The swordfish was nice and juicy and I think that’s the first time I have ever had swordfish come to think of it… It was perfect with a good splash of tabasco sauce and the fried rice was delicious with bits of bacon and sausage. When I reached for the tabasco sauce one of the NOAA guys taking us around said ‘I knew it! All my Korean friends put tabasco sauce on everything!’ I think I just kinda smiled innocently and said something along the lines of ‘yea, it tastes good spicy’ while dousing my omelette with tabasco. I’m also pretty sure I also paid and extra 25 cents for the biodegradable container and got styrofoam instead. hrmm. It’d be better if they added 15 cents to everything and automatically served everything in biodegradable containers. Cons: where’s my biodegradable container I paid for that will make me feel less guilty when I throw it away? don’t make it a choice and just make all the containers biodegradable, are you listening nico’s? plastic forks. guh just ups the guilt factor. more on that later. 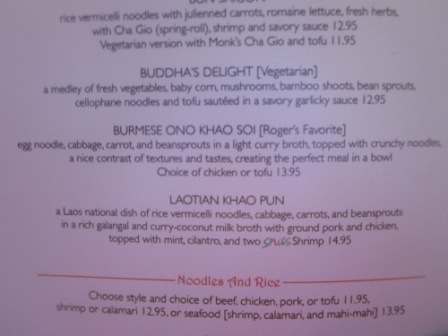 and maybe more fish-eating-vegetarian friendly options like fried rice without bacon? What is worth getting up at 4:45 in the morning for? A fish auction. I am interning with NOAA (National Oceanic and Atmospheric Administration) at the Pacific Island Fisheries Science Center (PIFSC) in the Coral Reef Ecosystem Division (CRED) fully immersed in the alphabet soup that is the government. A few weeks ago all the interns got to go see the fish auction in action and a tour of the NOAA offices. The auction starts at 5:30 with the ring of a bell but unloading of the ships can start as early as 1am. The fish are all laid out on little platforms on ice and on some fish samples are cut out at the tail end for prospective buyers to inspect. Core samples are also drilled and displayed to show interior meat quality. Tunas are unique fish because they maintain warm internal body temperatures which allows them to be very active and top predators in the ocean. Their warm body temperatures can deteriorate the quality of fish if it becomes too elevated, for example, ‘burning’ the flesh if the fish struggles for a long time on the line. The auctioneer and potential buyers move down the rows of fish and bid on a price per pound of each fish. The fish are all weighed beforehand and the price is dependent on a variety of factors the the 4 C’s of diamonds: color, clarity, carat (size), and cut (I forget how ‘cut’ translates to fish quality). A variety of buyers come to the auction including restaurants, retail, and wholesale. 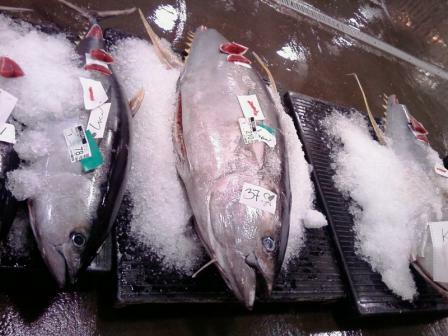 The fish are sold locally and also imported to Japan, Canada, and Europe. 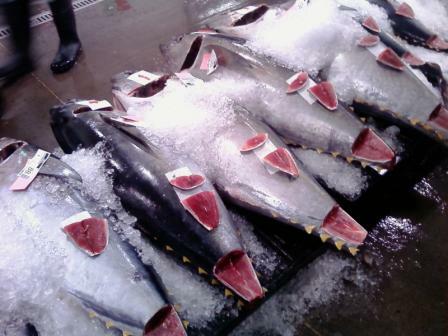 Here you can see the tunas laid out on ice on the platforms with portions near the tail cut out to inspect. On the middle fish you can see a small white piece of paper on the gill with the core sample. The Honolulu Fish Auction is unique because it is a high value, low volume fish market. For 2006, Honolulu ranked 38th by weight of fish landed (20.1 million lbs) for US ports and 4th in terms of value ($54.6 million). That morning only one ship came in with 25 thousand pounds of fish so the prices were higher. Under “longline” you can see the Sea Pearl came in with 25,000 pounds of catch. At the bottom, “troll” is another method of fishing and since it is a smaller boat the types of fish are counted up. “Bottom” refers to the “Deep 7” bottomfish which is closed off during part of the year to ensure a sustainable bottom fishery (more here). Longline fishing is when boats put out kilometers of main line with individual baited lines spaced out along the length. 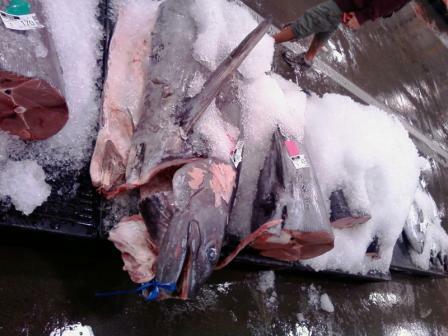 The US longline fishery in the Western Pacific Region is primarily in Hawai’i and American Samoa. In Hawai’i the longline fishery is limited to 164 vessels with 130 active vessels. Shallow longlines target swordfish while deep target tuna. 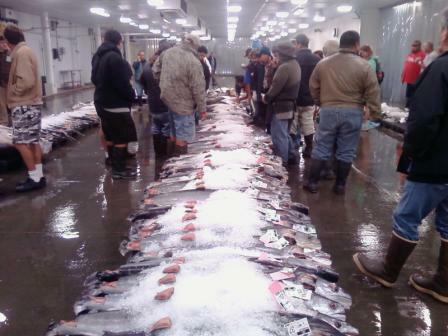 In 2008, the Hawaiian and American Samoan longline fisheries landed 14,000 metric tons. Trolling is a method of fishing where one or more baited are drawn through the water. 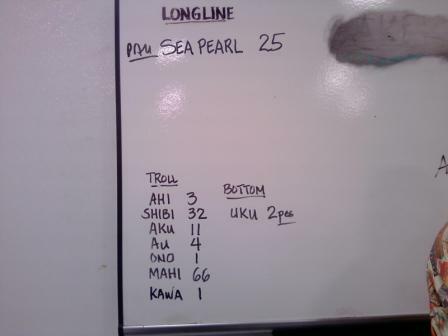 In the US Western Pacific Region, trolling is the largest commercial pelagic (open water) fishery in terms of participation with 1,404 troll vessels in Hawai’i. Catches are comparatively modest at 1,700 metric tons in 2008 with catches dominated by yellowfin tuna, mahimahi, and blue marlin. Longlining is controversial because of the bycatch, or non-target animals that are caught such as turtles and albatrosses. There are mitigation techniques in place and continually being developed to decrease bycatch. I had a negative impression of longline fishing before I came to the fish market from bycatch and its use to catch sharks. Although that has not quite changed the fish auction really showed that longline fisheries are much more efficient means of fishing. Seeing all of these fish laid out on the floor also stimulated a sort of emotional response in me. I wasn’t crying at the auction or anything but it was a little sad to see some of these majestic animals with their tails lobbed off lying there on ice. Some of these fish were decades old and just a day ago were swimming in the ocean. In general, people have become so disconnected from where our food comes from. We never picture the 80 pound tuna our sushi was filleted out of or the cow that fresh lookin’ steak came from in the grocery store. I do eat fish and meat rarely and I do think it is important for people to reconnect with the origins of our food. 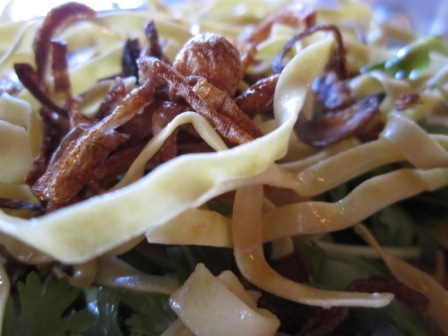 Seafood in Hawai’i is unsurprisingly a very important part of the culture. Hawaiians love their seafood and it is good. I love seafood and am all for it when it is harvested in sustainable way. There is a lot of science that goes into managing fisheries effectively and it was cool to see the outcome of all of that at the auction. 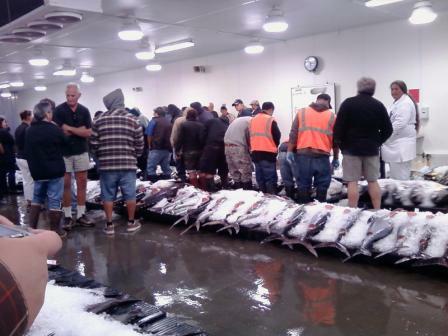 The Honolulu Fish Auction was was a really interesting and eye-opening experience that made me think a bit. What else can we do but eat, live, and learn? Happy Independence Day from O’ahu!